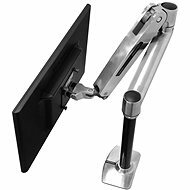 With this quality stand you'll be able to attain the best ergonomic position of your display to give your eyes, back and neck the right comfort. 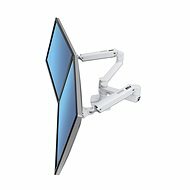 A sturdy, polished aluminium construction ensures reliable mounting of two LCD monitors up to a maximum size of 24", with a maximum load capacity of 18kg. 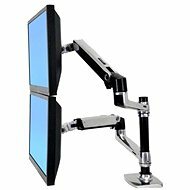 The patented CF technology ensures very easy and, above all, very effective adjustment of the monitor to virtually any position. 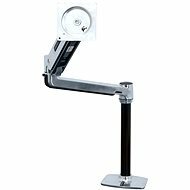 It supports the VESA interface and is also suitable for mounting TVs. A very practical feature of this model is the possibility of passing cables through the body of the stand. 75×75 mm, 100×100 mm Done! 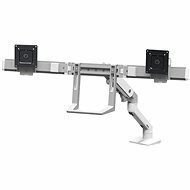 For shipping to other EU countries visit this page ERGOTRON LX Dual Side-by-Side Arm. Für Versand nach Deutschland, besuchen Sie bitte ERGOTRON LX Dual-Side-by-Side-Arm - Silber Schreibtischhalterung, für 2 x 24", verstellbar, max. 18,1 kg. Chcete doručit zboží do Česka? Prohlédněte si ERGOTRON LX Dual Side-by-Side Arm. Chcete doručiť tovar na Slovensko? 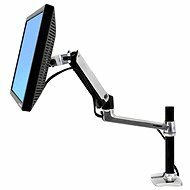 Prezrite si ERGOTRON LX Dual Side-by-Side Arm. Für Versand nach Österreich, besuchen Sie bitte ERGOTRON LX Dual-Side-by-Side-Arm - Silber Schreibtischhalterung, für 2 x 24", verstellbar, max. 18,1 kg. Magyarországra történő kiszállításért tekintse meg ezt a termékoldalt: Ergotron LX Dual Side-by-Side monitorállvány.